or copy and paste sections onto different page. 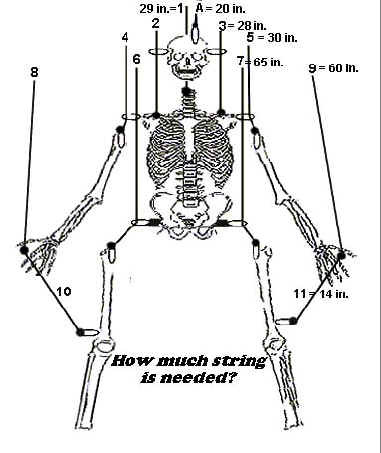 Use the skeleton stringing diagram below as a math problem for students. Processes used to acheive answer will include addition, multiplication, and conversion of inches to feet. String # 1 and string A are the only two strings that are not duplicated elsewhere on the skeleton. For example, string # 2 is the same length as string # 3, which is 28 inches. These duplicated strings should be figured into the math problem when calculating how much string in total is needed. HOW MUCH STRING IS NEEDED? A puppeteer is busy putting strings on 2 skeleton puppets for a show. He has already put strings on half of one skeleton, but now it looks like he may run out of string. He has some string left, but needs to know how much string he will need to finish both puppets. Can you help? Use CLUES at bottom of picture to find answers to the next questions. How much string does he need to finish one puppet? How much string is needed in total for one puppet? How many inches? How many feet? Also remember, there are 2 puppets! How much string does he need for the other puppet? For both puppets together? How many inches? How many feet? CLUES: String # 1 and string A are the only two strings that do not match another string on the puppet.